Do you know what's so special about the blue agave plant? Find out what that secret is and so much more on the Tequila Express tour. This tour is entertaining for people of all ages and very educational and just another great reason why Guadalajara, Mexico vacations are so much fun. The agave tequilana or Weber's blue agave is a plant which looks like a cactus but isn't. There are tons of species and only this particular plant produces the best quality tequila. When you arrive, you'll see rows of them. When I first saw them I thought it was strange that so many would be planted around. What were they there for? I actually noticed them from the plane as we were landing in Guadalajara. It wasn't until a fellow passenger informed me that they made tequila out of them. 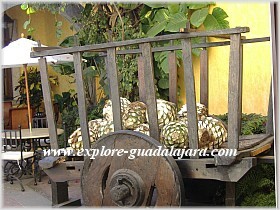 On the Tequila Express tour you board a train that starts in Guadalajara. When you first arrive at the boarding terminal you're greeted by a live Mariachi band. As they play the crowd really starts getting excited with some occasional whooping and hollering (mostly by fellow Mexicans). You know that you'll be in for an exciting adventure. Check necessary things for Outdoor Recreation to make your tour enjoyable! You'll board the train and head into the countryside of the lovely Amatitán Valley. It takes about 1 hour and 30 minutes to get there and you're entertained the whole way and will enjoy the comfortable train ride. They offer snacks, beverages beyond the eye can see (open bar) and you are serenaded with music until you reach you're destination. 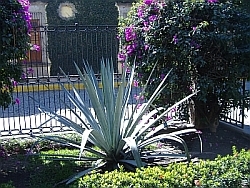 You'll arrive at hacienda San José del Refugio where the famous Tequila Herradura is made. On this educational tour you'll see many things, from the plants growing in the field to learning about the harvesting of the agave hearts called piñas. Did you know that blue agaves can't be harvested until they're about 10 years old? Spiky fleshy leaves of blue agave can grow more than 2 meters (6 & 1/2 ft) in length! On your Tequila Express tour you'll also learn about the new and old fermentation/distillation process of this famous tequila drink made with pride in Mexico. Later in the afternoon you will sit down and enjoy a really tasty buffet lunch with traditional Mexican dishes such as Sopes, Tortas ahogadas, tacos and more. I'm getting hungry just thinking about it. Don't forget it is open bar so you can have all the fine Tequila you can handle! Are you ready?? One more thing, they recommend you purchase your tickets about 10 days in advance. Don't forget the Tequila Express.